Their creepy appearance is a harsher reality than they are, biologist says. Carnivorous jumbo squid have been washing up on San Diego beaches and swarming in Southern California’s coastal waters, freaking out scuba divers and bathers this month, but a biologist now says these beasts are not man-eaters, despite concerns expressed in the media. Reports started coming in earlier in July that dozens of the squid, also known as Humboldt squid, were washing ashore and interacting with divers. Jumbo squid can grow up to 7 feet long and usually prefer to live in deeper waters. Lately, off-shore divers have reported seeing large groups of the squid, which can swim as fast as 15 mph. For years, Seibel has heard stories claiming that Humboldt squid will devour a dog in minutes and could kill or maim unsuspecting divers. 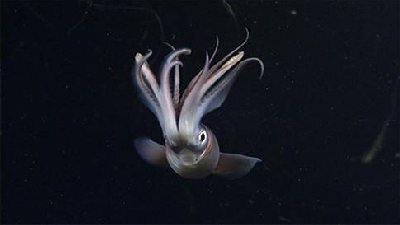 “However, I want to spread the word that (Humboldt squid) aren’t the aggressive man-eaters as they have been portrayed,” Seibel said. Jumbo squid have pulled with their tentacles at divers’ masks and equipment, and at one diver’s arms, according to the San Francisco Chronicle. Scientists have no firm idea why the squid have suddenly invaded San Diego’s coastal waters, but it could be anything from global warming to a shortage of food or a decline in jumbo squid’s predators, according to the newspaper. Scuba diving at night in the surface waters of the Gulf of California in 2007, Seibel scanned the depths with his flashlight and saw the shadows of Humboldt squid far in the distance. After he got up his nerve, he turned off the light. When he turned it back on again 30 seconds later, he was surrounded by what seemed like hundreds of the squid, many just 5 or 6 feet away from him. Most were in the 3- to 4-foot size range, while larger ones were sometimes visible in deeper waters. But the light appeared to frighten them, and they immediately dashed off to the periphery. The URI researcher’s dive was part of a scientific examination of the species, which some call “red devil,” to learn more about their physiology, feeding behavior and swimming abilities. The original and complete article can can be found here. Dude, WTFO? No showings at Sunday services. No posted dives, just news articles to fill space. So what’s the deal? Did you sell the Duster, buy a Prius, and become a surfer?